We went to Camp Cedarwood for the weekend. My husband, a pastor, was speaking for our church's young adults retreat. Cedarwood is one of my boys favourite places to go. Lots of room to run, inside and out, and lots of fun winter activities. They had a blast. 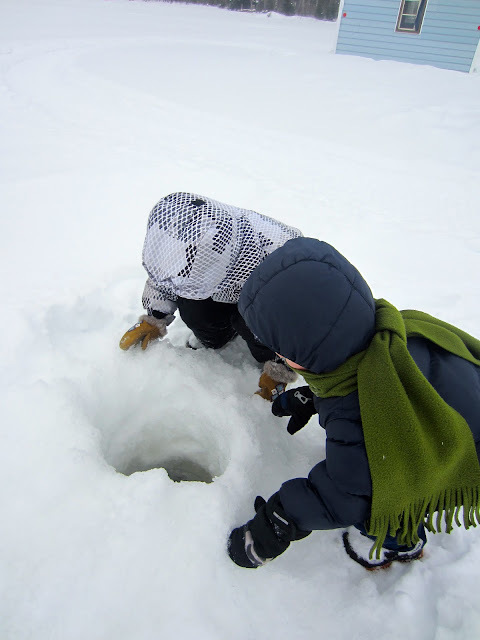 While my husband was speaking, I took the boys outside to watch some ice fishing. We tagged along with one of the Cedarwood staff guys and his sons. A perfect ending to our Arctic studies. The orange flag pops up if a fish is caught. There were 6 ice fishing holes drilled with the auger. Abishai and Micaiah love sledding at Cedarwood. This year they went down by themselves.